Is your charitable giving something of a bore? Is it that task that you get through as quickly as possible? Is it more duty than pleasure? If it is then you might just find that a giving circle is a perfect cure! If you’ve ever been in a book group or an investment club, you would probably enjoy a giving circle. All these activities have something in common; They're more fun when they're done together. A giving circle makes charitable giving more fun. Giving circles can be small and informal, something like a neighborly potluck, with a few people pooling their money and giving it to a chosen charity. Alternatively, they can be highly organized, require contributions of thousands of dollars and a commitment of many years. Whether informal or highly organized, giving circles allow donors to pool their contributions, achieving a greater impact. Plus, the hard work of researching organizations and figuring out where your donation can make the biggest bang seems a whole lot easier when shared with others. Models of the democratic process, giving circles give donors equal voice in deciding where their charitable contributions go. 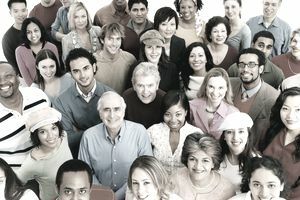 In the process, donors connect with one another and with their communities. Who Participates in Giving Circles? Giving circles were particularly attractive to younger people, minorities, and women. According to one study, 70 percent of giving circles (aka "collectives") have women majorities while 50 percent have only women members. Another study found that giving circle participation is much more strongly related to age than to income with nearly half of all participants under the age of 40. Americans of African, Asian, and Hispanic descent also join or form giving circles​ at about twice the rate of non-Jewish whites. According to estimates by The Collective Giving Research Group, giving circles have, in total, given $1.29 billion from 150,000 donors over the years. Does Membership in a Giving Circle Make a Difference for Its Members? According to Angela Eikenberry, the most well-known researcher of giving circles around the world, belonging to a giving group does make a difference. Members of giving circles seem to donate more than other types of donors. Plus, the more engaged they are in the process of determining what groups to give to and how much, the more they gave. People who were more engaged, for longer, and who belonged to multiple giving circles all gave more than the typical donor. Giving Circle members also tend to give more strategically. They do more research, are more willing to fund the operating expenses of charities, and consider issues of class, gender, race, and culture when making giving decisions. In turn, compared to givers not in a giving circle, members gave more often to groups that support women and ethnic and minority groups. They also favored the arts, culture, the environment, neighborhood development, advocacy, and international aid. Their giving was less “traditional” than usual for donors. The more engaged people are in a giving circle, the more they express civic responsibility. They become involved in community issues and in changing government policies. Giving Circle members have a more positive view of how philanthropy can affect the health of communities and about the role of government in making a difference. They felt more empowered to make a change themselves. Eikenberry suggests that, given the results of her research, giving circles should focus on keeping members engaged and involved for the long-term. She suggests that smaller circles seem to have the most positive effect on the civic engagement of their members. She also found that traditional giving was not replaced, but enlarged through diversifying the pool of candidates for funding. However, giving circles do seem to decrease giving to federated funds such as the United Way. Giving circles can be very effective at involving members in community and policy issues and introducing them to “off the beaten track” charities and causes. There are plenty of good reasons to initiate or join a giving circle. Pooling money with others and focusing on a critical issue can have a far greater impact than individual gifts. Also, the collective wisdom and know-how of a group create value and impact to charitable investments. Developing partnerships with a smaller number of charities can create a deeper level of involvement for donors and the nonprofits they support and it can be fun to be part of a group and fulfilling to contribute in such an innovative and insightful way. Provides the opportunity to join with like-minded individuals, such as those who wish to support faith-based organizations or members of a particular ethnic group. There are many ways to set up a Giving Circle. Do some research (see sources below) to see the breadth of models and to help you decide how to configure your own. First, determine your mission. What are your goals? Do you want to benefit local nonprofits or do you wish to give globally? What issues interest you? Will you support one charity or several? Decide how large your group should be and how to organize it. Do you want a small group? Do you need committees? Will you hold events to raise funds? How much will you want your members to contribute? Will you include volunteer work in your activities? Do you wish to become a 501(c)(3) organization? Decide where your group will put your money while you decide where you will donate it. Do you need a bank account? You may choose to have all the members write individual checks to the group you agree to fund. That alleviates the need for any separate account. Alternatively, do you prefer a sponsor, such as a local foundation, to help you manage and distribute the funds? Meet with those nonprofits you are interested in supporting to find out what they do, how they do it, and how efficiently they spend their funds. You may ask for formal requests from groups that would like your donation, and after you contribute you will want progress reports from the recipients. If you are interested in starting a Giving Circle or affiliate with an existing one, start with the Giving Circle Network. You'll find a ton of information and tips. If you're a member of AARP, check out that organization's guide to starting a giving circle for women.